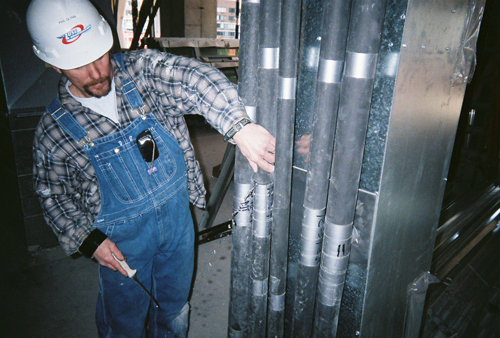 There are a number of issues related to mechanical insulation the industry needs to address, including outdated specifications, incomplete drawings and bid documents, “value engineering,” improper pipe support systems, inadequate clearance between insulated systems, improper insulation systems for air handling ductwork, and performing insulation prior to the sealing of the building envelope. The Illinois Regional Insulation Contractors Association (IRIC) Standards Committee members met with several architects and mechanical engineers in November 2010 to tackle these issues. The purpose of the meeting was to discuss areas of the construction process that have become difficult for mechanical insulation contractors and to create support for an advisory committee consisting of contractors, architects, and mechanical engineers. Topics of concern for both the mechanical insulation contractors and the architects and engineers were discussed. This was the first meeting between these third-tier mechanical insulation contractors and the front-line architects and mechanical engineers. Most of those on the front line know and understand there are problems with mechanical insulation specifications and field execution, and all want to assist in rectifying the problems. The first item up for discussion was specifications. 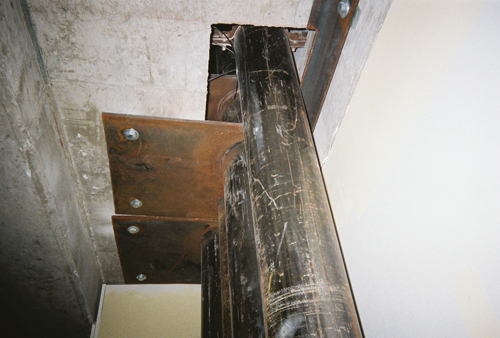 It was noted that the contractors still see specifications with materials that have been discontinued, insulation schedules that do not identify the thickness of the materials, specifications requiring duct lining where lining is not acceptable, and a myriad of other contradictions to quality insulation standards. In fact, one of the charges of the Standards Committee is to assist engineers in updating their specs. Several of the mechanical engineers indicated that they know their specifications are outdated, incomplete, and are specifying materials not manufactured today, and some asked Standards Committee members to assist them in reviewing their specs. The Standards Committee is assisting some school districts in reviewing their specs now. The design and engineering community recognize this problem, but most don’t have time to go through the mechanical insulation spec. It was noted that poor specs are usually overlooked until there is a failure and the costs associated with the failure begin to pile up. Two solutions were discussed. First, the engineering community will attempt to update their specifications. Second, the mechanical insulation contractors will correspond with the specification creator when they see portions of specs that are inadequate, if there is time. Both parties recognize that time is the great enemy in this process. Bid deadlines and the fact that the mechanical insulation contractors are usually third-tier vendors keep them from accessing the decision makers. Following the specification discussion, the problem of incomplete drawings was addressed. One of the architects asked what kinds of things are missing from the drawings. 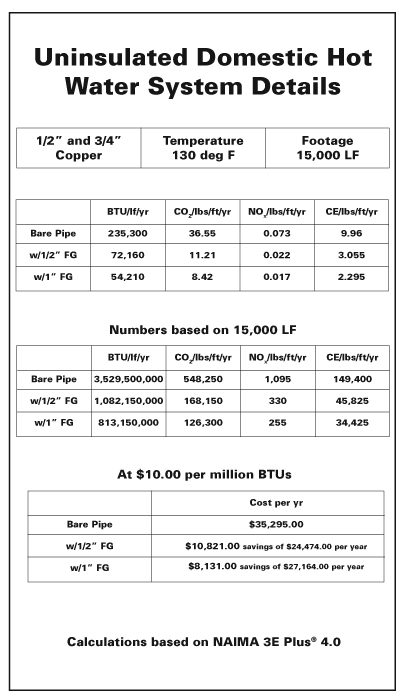 The response was a litany of items, including ductwork not sized properly if at all; pipe systems not complete; pipe systems not sized; areas of the building with no mechanical systems shown; no room finish schedule or ceiling schedule to show which ducts and piping are exposed and which are concealed, or which are in conditioned and non-conditioned areas; incomplete equipment schedules; no sizes for much of the equipment; and refrigeration system piping not shown or sized. The above specification and drawing problems can be mitigated to some degree. Most contractors apply additional costs to the bid when the spec or drawings are inadequate. Others, however, overlook these problems or don’t see them at all, and can wind up with a project without sufficient funds to complete the mechanical insulation work in a profitable manner. The gray area left after poor specs and drawings allow for abuse of the bidding system and greater costs to the owner. The third item on the agenda was “value engineering.” When “value engineering” is discussed with a group of architects and engineers, they laugh. Why is that? Could it be because they know real “value engineering” does not mean remove insulation from the hot pipe system to save money on the installed cost of the building? Could it be that they know real “value engineering” can mean increasing the mechanical insulation thickness to offer the owner reduced cost to operate his/her building and reduced carbon footprint and greenhouse gas emissions? This fight to end “value engineering” as we know it is far from over. Mechanical insulation contractors across the country, both union and open shop, are offering real “value” in this “value engineering” model. The days of “value engineering” mechanical insulation out of a building are numbered. Those who allow it to happen to their building will pay in the cost to operate the building on both the cooling and heating cycle. All in attendance at this meeting agreed that it is time for a change. Recently this author had the opportunity to calculate the heat loss for a building owner that took a credit for not insulating the domestic hot water lines in the walls of a new building. Figure 1 shows the costs associated with this decision. Over 20 years it will cost the owner more than $950,000. The owner received the “value engineered” amount of $74,000 in credit for not insulating this pipe, so the net cost to the owner is around $875,000 over 20 years. Was that really “value engineering”? The fourth item on the agenda was improper pipe support systems. The architects and engineers did not (nor should they) accept responsibility for improper pipe supports, except that they should discuss these problems with the general contractor and mechanical contractor during field visits to the project. 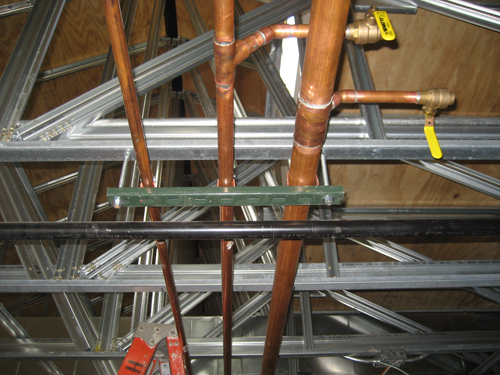 Figure 2 shows copper dual temp piping attached to a unistrut. There are not enough support rods to lower the unistrut to allow for the insulation to run through the support. The mechanical contractor expected the insulation contractor to cut out for the unistrut. This, of course, could be disastrous on cold piping systems. 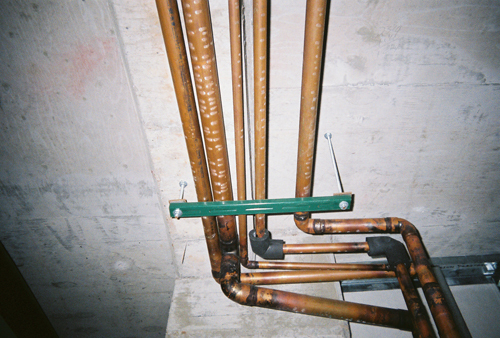 Figure 3 shows copper domestic water piping clamped to a unistrut. The plumber argued that the bushing material (meant to separate dissimilar metals) is an insulator and therefore there is no need to insulate the pipe system at the unistrut. The architect on that project, who was in attendance at this meeting, did not buy the plumber’s argument. The plumber had to replace all the supports with proper material that allows for complete insulation of the system. The contractors explained that they have seen welded saddles on chilled water pipe systems, “T” supports welded to chilled water pipe, and suspended clamp hangers on chilled water pipe. They talked about chilled water and steam pipe systems resting on the same support channel with no provision to separate the systems. 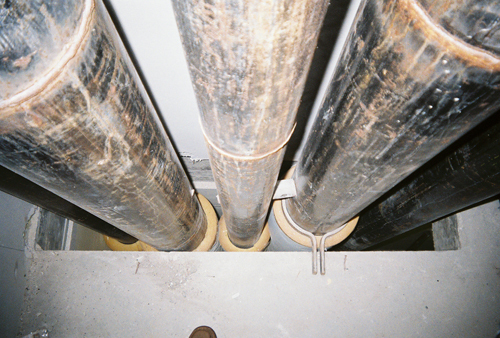 Figure 4 shows a floor support for chilled and hot water riser pipe systems. The heavy gauge steel plate is welded to all the pipes above and below the slab. The mechanical contractor said, “Just make it work.” Throughout this conversation, it became clear that somebody was not doing his job; otherwise these situations would not occur. One of the architects at the meeting said he didn’t understand the problem. If the pipe or duct system is installed improperly, make the contractor do it right; tear it out if necessary. In the real world, with the time constraints construction is under, “fix it” sometimes doesn’t work because there is no time. The same architect retorted that he didn’t care if they had to do it working 24 hours a day. So the insulator must try to make it work. The times are changing, however. The insulator is writing letters saying he will not be responsible for these kinds of conditions. One of the most interesting aspects of this discussion was that the architects spend much more time on job visits than do the engineers. The architects can see to it that support issues are avoided. pipe risers running from floor to floor in cored holes too small for the pipe with the insulation. Figure 5 shows chilled water and hot water pipes too close together and running through a floor. The opening is not large enough and the pipes are too close together to allow the proper insulation thickness to be installed. The architects asked whether insulation contractors are included in the pre-construction meetings to help avert some of these issues. Third-tier contractors are seldom included in this important meeting and are expected to make do and not rock the boat. Several of the architects indicated that they would ask the mechanical contractor to bring the insulation sub-contractor to the pre-construction meeting so the important issues that pertain to mechanical insulation can be addressed. The issues that pertain to pipe installation and sheet metal installation will be brought to the trades that perform that work as a direct result of this meeting. Many states and cities have different codes that regulate what is acceptable for insulation or lining on sheet metal ducts. In most areas lining is not acceptable on fresh air intake ducts because dust, dirt, and moisture can be carried into the duct system along with the outside air and create an atmosphere for mold growth. Many regions don’t allow lining on make up air ducts to kitchen hoods. Most states don’t allow supply and return air ducts servicing operating rooms to be lined. The same is true for patient care rooms and birthing rooms. The committee said that infractions of these codes are frequently seen in local markets. Usually, when an engineer is told of this problem, they allow the external insulation to be installed. So the engineer has specified insulation on the exterior of an outside air intake duct. The design for the system is 10°F. But what if the area is subject to frequent -15°F? Ten degrees could be an average for the area but three or four days of -15°F could mean failure. All the architects and engineers agreed and indicated they would make sure that lining is used only where it should be and can be used safely. Every mechanical insulation contractor has been asked or forced to insulate a system prior to the building being closed in. The arguments against this practice fall on deaf ears—that is, until a problem arises. Figure 6 shows what can result from insulation being installed prior to the closing in of the building: water pouring out of the insulation system. The pipe shown is factory insulated by the fan coil manufacturer. You can tell by the use of duct tape on the system—most good insulators do not use duct tape to secure flexible elastomeric insulation. The water accumulated on the floors of the building from rain and snow and poured down the chase openings, filling the insulation system with moisture. Mechanical insulation contractors are frequently told to protect their work and proceed even under open building conditions. The concoction created by the snow melt chemicals, the residue from the concrete, and other agents on the floors can cause stress on the pipe while trapped under the insulation. The cost to repair such stress on the pipe can be astronomical. The parties who attended this first luncheon to address mechanical insulation issues all agreed that they should do it often and should introduce new materials during this event. The input from the design and engineering community was very valuable and will assist contractors in the future. “The Forgotten Technology” is finally getting the recognition it deserves as the original green technology in construction. The attendees at the IRIC luncheon don’t want to find themselves trying to work through a problem that could have been avoided by the correct installation of mechanical insulation.